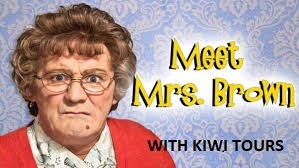 The tour to Mrs Brown's Boys, is sure to be a side splitting weekend away! On Saturday the 10th of March we will depart New Plymouth for Auckland, to see one of the worlds’ most funniest comedy acts, being performed at the Vector Arena. Mrs Brown has put the whole family into her suitcase and is heading to New Zealand in 2018! Featuring the original cast from the BBC TV series, Mrs Browns Boys Live is jam packed with all the laughs and drama you can expect from the mother of all comedy. Get ready to experience everyone's favorite mother hen at her most outrageous in her Live Tour. Prepare for a riot of bad behavior as you see Mrs Brown Live and unleashed in a show jam packed with all the laughs and drama you can expect from the mother of all comedy. Featuring your favorite characters from the series, the live show is a must see you are guaranteed loads of big laughs. So if you loved Mrs Brown's Boys the series you will love Mrs Brown's Boys Live Tour: Good Mourning Mrs Brown. Feckin’ hilarious and completely uncensored; Mrs Brown’s Boys Live will have you rolling in the aisles!